In a nutshell, The Fuller Brush Man is one of the funniest movies I’ve ever seen. Red Skelton is at his finest, both in verbal comedy as well as in physical slapstick galore. The basic plot has Red Skelton playing the part of Red Jones, a well-meaning young man who keeps getting fired from every job he’s ever held within three weeks. The girl he loves, Ann Elliot (played by Janet Blair) refuses his marriage proposal until he matures enough to be able to provide for a family. Red decides to emulate his rival for Ann’s love by becoming a door-to-door salesman for the Fuller Brush company. Unfortunately, this leads him to be the witness to a murder, with the police and gangsters following him … and why are the bad people interested in one of his hairbrushes? The comedy comes fast and furious, and gives Red Skelton ample opportunity to work his magic, with slapstick, verbal comedy, and comedic action scenes that come straight out the Looney Tunes cartoons which isn t surprising, since Frank Tashlin (former Looney Tunes artist and director) wrote the screenplay. There are truly too many comedy highlights to list – Red accidentally setting fire to a park as a sanitation worker, a series of vignettes attempting to be a Fuller Brush man where he runs into one of his radio characters, the Mean Little Kid, baby , hiding in the garden of the crooked Commissioner of Sanitation who fired Red earlier in the day, Red’s interrogation, a truly hilarious scene in his apartment, where one set of characters come in after another, with Red hiding a half-dozen assorted villains in his too-small kitchen, the entire finale of the movie that would fit in a cartoon, etc. I laughed long, loud, hard and often, as did my children who were watching it with me. I recommend it highly, and I rate it a (very rare) perfect 5 clowns. Red Jones (Red Skelton): So what if I was late to a fire? I saved the house. Ann Elliot (Janet Blair): By that time the house had already burnt to the ground. Red Jones (Red Skelton): But I saved it; I ve got the ashes at home in a little box. Wallick: I bet you told the commissioner off. Red Jones (Red Skelton): I gave him a piece of my mind. Wallick: That’ll set him back a couple of years. Ann Elliot (Janet Blair): Give him a chance. Wallick: Okay, but it’s like watering a weed with champagne. Baby : When I ask men to do something, they eat out of my hand. Red Jones (Red Skelton): I’ve already had my lunch. Baby : They can’t get me out of their blood. Red Jones (Red Skelton): This is no time for a transfusion. Red Jones (Red Skelton): [to a grandmother with a bratty child] Here Grandma, a complimentary brush, sorry we don’t have one with a nail in it. Red Jones (Red Skelton): Stop squeezing my Adam’s apple! Commissioner Trist [choking Red]: I’m not squeezing your Adam’s apple! Red Jones (Red Skelton): Then why am I tasting cider? Police officer: [holding out Fuller Brush case] Who gets this? Red Jones (Red Skelton): I might as well take it – I always get left holding the bag. Red Jones: It’s just as well, if I’d gone to another house, Dracula probably would’ve lived there. Red Jones (Red Skelton): [giving skirt back, after having accidentally ripped it] Put that on! Red Jones (Red Skelton): Same place you had it before! Freddie: [going to hide in the kitchen] Let her in! And remember, this gun is loaded. Red Jones (Red Skelton): So’s the kitchen. Mildred Trist (Hillary Brooke): Is there another way out of here? Red Jones (Red Skelton): Yeah, out that window, four floors straight down. Lt. Quint: Are you with him or against him? Ann Elliot (Janet Blair): With him … when he’s in trouble. Red Jones (Red Skelton): Isn’t it wonderful? I’m always in trouble. Red Jones (Red Skelton): That’s right son, I used to be a big game hunter. It got so I didn’t have to shoot the critters, they see me coming, they just up and surrendered. Ann Elliot (Janet Blair): If she weren’t guilty, she would have never denied buying those brushes. Red Jones (Red Skelton): That’s her story, but her husband got stuck with it. Criminal: What do you mean, extra aces? Red Jones (Red Skelton): I saw you hide them under the blotter. Murder’s one thing, but cheating at cards – tsk tsk. You oughta be ashamed of yourself. Radio, with businessman listening: An now, we shall hear the senator from Massachusetts, who will speak on what the government should do about big business. Red Jones (Red Skelton): [interrupting radio broadcast] Blow em up! Blow em up! Hurry! Blow em up! Businessman: That’s the Democrats for you! Red Jones (Red Skelton): Fine camouflage net, everywhere I go, they see me! Red Jones (Red Skelton): [kisses Ann, then blows out smoke] What a kiss. Ann Elliot (Janel Blair): [blows out smoke] What a Fuller Brush Man. Lt. Quint: [as Red and Ann are kissing] Why, is there a law against it? A major part of the movie involves a murder and a disappearing dagger. Red Skelton’s character discovers someone has made the dagger by soaking the handle of one of his brushes in hot water and reshaping it. When the handle is put back into hot water it returns to its original shape. After trying numerous ways to make this look realistic with special effects the producers finally went to a plastics company and had them actually develop a memory plastic . It was such a big story that it was in an article covered in Life  magazine. 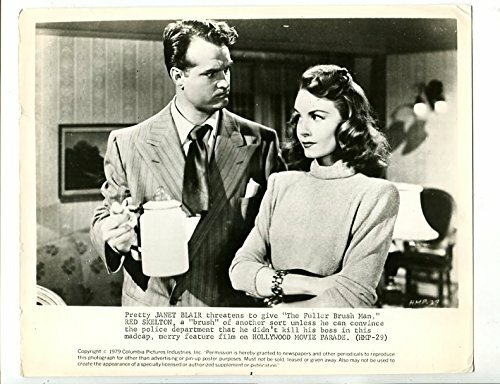 “The Screen Guild Theater” broadcast a 30-minute radio adaptation of the movie on January 20, 1949 with Red Skelton and Janet Blair reprising their film roles.